As the 2015-2016 Rotary year began, the Rotary Club of Takaro, NZ was looking for a new project to reignite the club, and after some brainstorming, the “Girls’ Sheds” project was born. Fortunately the club had some experience with this type of event, having held “Garden Tour” and “Man Cave” projects several years before. The Rotary club first developed a talent pool of member’s skills to help identify gaps and then found people with the needed skills to enhance the project team. Tasks were allocated and time frames set for completion. It quickly became clear that the club was onto something great, so the excitement grew and a launch date of Valentine’s Day was chosen. Club members were able to cover most functions using their wide pool of skills, including extensive promotion on social media using a regularly updated Facebook event page and Eventfinder, plus posters throughout the community, all supported by an advertising campaign on radio and in newspapers. 21 Girls’ Sheds on 15 sites around Palmerston North participated in the project and each also donated items for the raffle. On Saturday February 14 the weather was perfect. Each of the 260 ticket holders met at the community hall and picked up a map and a guide for the day and viewed a PowerPoint presentation with photos of the sites, so guests could choose which ones they were most keen to explore and maybe buy some of the products on sale there. 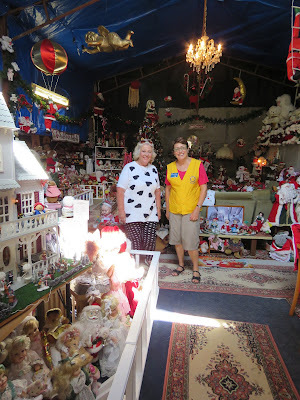 Raffles tickets were purchased, picnic lunches collected and the tour began to see what the “girls of Palmy” and surrounding areas are doing in their special spaces. The $860 ticket sales for the donated raffle covered the day’s costs, including lunches. Two Rotarians were assigned to each site to act as guides and security for the “Sheddies”. The guests found out about what local women do in their sheds and were amazed at the variety creativity and talent on display, including doll making, garden art, glass, cheese making, soap making, jewellery, quilting plus other interesting ventures. To conclude this project, Rotary invited all of the “Sheddies” to a club night and presented each of them with a framed thank you certificate from Takaro Rotary.